North Carolina is credited with the first documented gold discovery in the United States, dating back to 1799 at the Reed Gold Mine. Since then, extensive amounts of gold have been found, mainly in the form of lode deposits as well as byproduct from copper and tungsten mining. Gold in North Carolina is primarily found in what is known as the Carolina Slate Belt, which runs diagonally across the state parallel to the Atlantic Ocean in the center of the state. The northern end starts around Granville, Person, and Caswell Counties, and extends to the southwest toward Union, Meckenburg, and Gaston Counties. At the northern part of the slate belt in Granville County, most gold production is from copper mining, but placers can be found in nearby streams. The same can be said for Person and Caswell counties, where many good placer streams can be found. Southward along the slate belt in Randolph County is the Hoover Hill Mine, which was a major producer in the area. The nearby Uwharrie River has rich placer gold deposits. Davidson County has numerous scattered lode deposits, and all waters have good potential for placer gold. The same can be said for nearby Montgomery County, which has yielded plenty of gold over the past two centuries. The Uwharrie River and its tributaries are worthy of investigation, as placer gold has been found there. 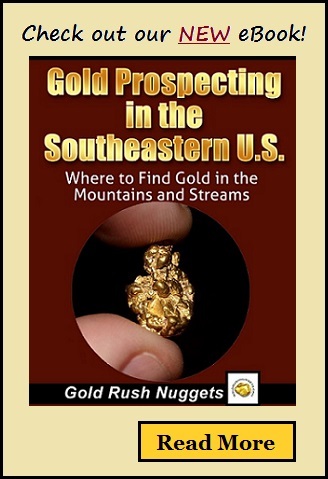 Stanly, Cabarrus, and Union Counties have plenty of historic gold production also. The Rocky River has yielded placer gold, and is worthy of prospecting. These counties are littered with various lode gold mines, and all waters are worth prospecting. The famous Reed Gold Mine is in Cabarrus County. Large nuggets have been found here, so metal detecting with a quality metal detector specifically designed to locate gold may be productive here. Other areas throughout the Carolina Slate Belt are all worth exploring with a gold pan. With the significant history of gold in the past, there is no doubt plenty of gold left to be found. Be aware that the vast majority of the gold bearing areas in North Carolina is on private property. Always seek out permission from landowners before doing any prospecting. Many will be more than willing to let you search for gold as long as you treat the land with respect.